What is a good substitute for the Marabu 'Dark Turquoise' silk colour? I was wondering if you could help me out. I normally dye silks and have used various brands. But recently I've been trying to get my hands on some dark turquoise. The make I bought before is no longer available. This liquid color is a free flowing concentrated liquid color for use on any untreated fabric. Requires heat fixing by ironing or being placed in a commercial clothes dryer. I've had no luck trying to mix one for myself as it always end up looking like teal. What would you suggest to get a good colour? I have many Dupont acid dyes but none of them are anywhere near what I am looking for. What dye did you use before that is no longer available? In some cases I can identify a specify dye chemical, which would help in suggesting an alternative. The dye in question was dark turquoise, an acid silk dye made by Marabu. Unfortunately it is impossible to identify any of the pigments used in Marabu silk paints, so I can't use that to help find the same dye under another brand name. In fact, it looks like the Marabu Silk Colours are not true dyes at all, but instead paints, in which insoluble pigments are combined with a binder to make the pigments adhere to the fiber. 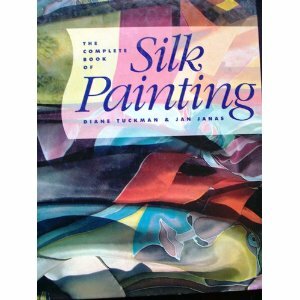 Dye-based silk colors are set by moist heat, such as by steaming, while pigment-based silk colors are set with dry heat, such as by ironing; as a result, dyes and paints cannot be used at the same time. The first of these two different types of color (dye or paint) you use must be fixed in place and any excess rinsed out before you use the other type of color (paint or dye) on the same piece. Key question: Is the unwanted color you've been mixing too dark, or too bright, too dull, too green, or too blue? If the color you're mixing is too dark, you might get the color you want simply by using less dye, or by adding more dye dilutant, while otherwise mixing it just the same as you have been doing. If your color is too blue, try adding a drop of yellow dye; if it is too green, try adding a drop of blue dye. If the color is too dull, then you need to find a clearer blue and green to use in your color mixing, with a blue that is more turquoise and less royal blue to begin with, or a yellow that is less orangish. When using Dupont Silk Dyes, which are mixtures of various types of unidentified dyes, to make the dye more blue, the mixing blue primary colors are supposed to be 265 ('Bleu Roy') and 205 ('Limoges'), though as a rule medium blue colors are not as good for mixing bright greens as more turquoise hues will be. To make it more green, use a little yellow; the mixing primary yellow colors are supposed to be 717 ('Jaune Primaire') or 715 ('Jaune de Chrome'). 'Jaune de Chrome' is more golden (orangish) than 'Jaune Primaire', so it will make a somewhat more olive hue when used to mix greens. Compare the Tinfix Celadon color on the "Name That Color" page mentioned above with the link http://chir.ag/projects/name-that-color/#01887A . Of course any specific dye color I mention may really turn out to be less satisfactory than the mixes you have already been making. We must be careful about concluding much from a color chip; since different computer monitors are calibrated differently, a color chip that looks like the right color on one monitor will look like a different color altogether on another monitor, so we are never sure whether what we are seeing online is what a manufacturer expects us to see. This is why printed color charts are more reliable than those you can see online; a company will send out printed color sheets only after checking that they have been printed correctly. They can't check for whether our monitors show us the same color as theirs are showing them. Even if the color chip we are looking at is correct, the brightness of the fabric that we dye, or the exact methods and concentrations we use, can alter the ultimate color considerably. That said, color chips are still handy to look at while thinking about dye colors. To play with mixing colors before you get out your real dyes or paints, I strongly recommend trying Olli Niemitalo's Dye Mixer Applet, at http://yehar.com/blog/?p=307 ; even if you don't find the dyes or paints you are using in its listing, you can still use it to clarify in your mind what happens when you add another color, by mixing similar colors from the list choices it includes.